Part II of “Don’t Harm Them Twice,” which focuses on suggestions for how to appropriate accurate terminology, will appear in a future edition of Mad in America. Special thanks to TK, phenomenal editor and benzo comrade, for your time and editing skills on this piece. My cognitively-impaired “benzo brain” could not have brought it to fruition without you. Thanks also to LD, SS, JF, AN, and LM for your input, continual encouragement, and unwavering support. “4.1 Hypnotics and Anxiolytics : British National Formulary.” Benzo.org.uk. 1 Nov. 2013. Web. 4 Sept. 2015. <http://www.benzo.org.uk/BNF.htm>. Ashton, C H. “Benzodiazepines: How They Work & How to Withdraw.” Benzo.org.uk. 2002. Web. 4 Sept. 2015. Ashton, C Heather. “History of Benzodiazepines: What the Textbooks May Not Tell You.” Psychiatric Medication Awareness Group. 12 Oct. 2005. Web. 4 Sept. 2015. Dawson, George. 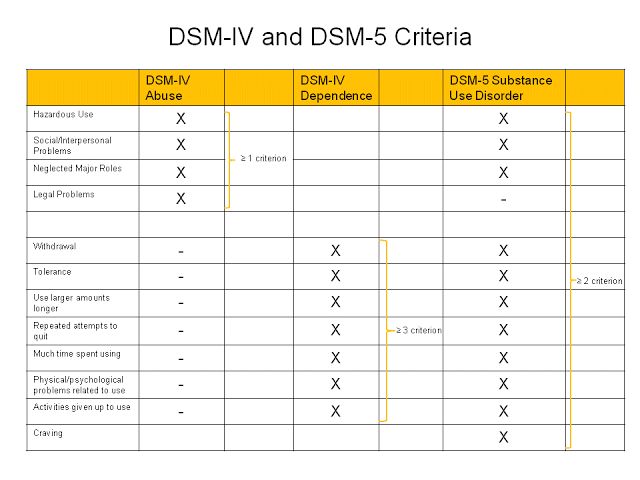 “DSM-IV to DSM-5 Addiction Graphic.” Real Psychiatry Technical Blog. 17 Sept. 2013. Web. 4 Sept. 2015. “Definitions Related to the Use of Opioids for the Treatment of Pain: Consensus Statement of the American Academy of Pain Medicine, the American Pain Society, and the American Society of Addiction Medicine.” American Society of Addiction Medicine. 2001. Web. 4 Sept. 2015. “Drug Scheduling.” United States Drug Enforcement Administration. Web. 4 Sept. 2015. <http://www.dea.gov/druginfo/ds.shtml>. Haslam, Barry. “My Successful Campaign for Dedicated Benzo Withdrawal Services – Mad In America.” Mad In America. 15 Aug. 2015. Web. 4 Sept. 2015. “Highlights of Changes from DSM-IV-TR to DSM-5.” American Psychiatric Association DSM-5 Development. American Psychiatric Publishing, 2013. Web. 4 Sept. 2015. Hitti, Miranda. “Prescription Painkiller Addiction: 7 Myths.” WebMD. WebMD, 10 Aug. 2011. Web. 4 Sept. 2015. “Physical Dependence.” Wikipedia. Wikimedia Foundation. Web. 4 Sept. 2015. Secher, Kristian. “Scientist: Antidepressants Cause Addiction.”Sciencenordic.com. 10 May 2013. Web. 4 Sept. 2015. Shipko, Stuart. “Shooting the Odds, Part III.” Mad In America. 1 Sept. 2015. Web. 4 Sept. 2015. “Substance-Related and Addictive Disorders.” American Psychiatric Association DSM-5 Development. American Psychiatric Publishing, 2013. Web. 4 Sept. 2015. The author has a BS in Biology/Health Science and went on to complete a professional post-graduate master's program and certification. While starting their career, a colleague prescribed Xanax for “work stress," which when taken as-directed caused tolerance and interdose withdrawal within a couple months' time. 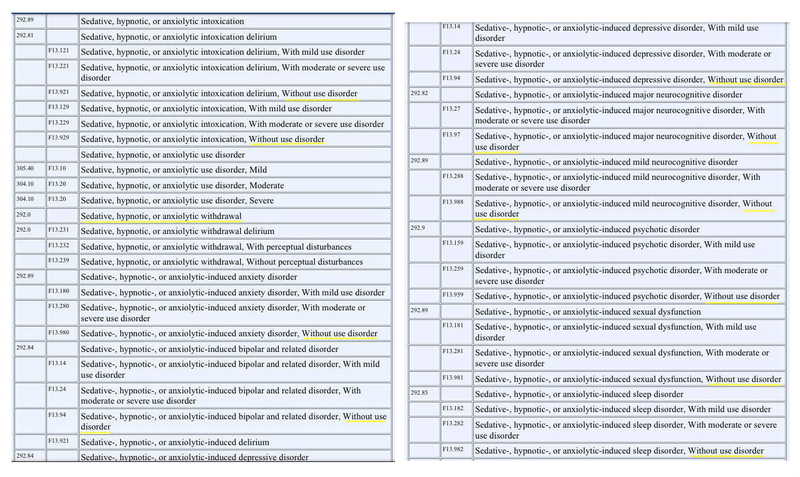 This was their unfortunate introduction to psychiatry, where the Xanax iatrogenesis resulted in multiple “mental illness” misdiagnoses and subsequent psychopharmaceutical polydrugging with six drugs (three of them benzos/Z-drugs) over the next five years. Rendered non-functional from the poly-drugging, they then suffered a barbaric and medically negligent cold-turkey in a detox center. They have been free from all psychiatric drugs for three years, yet still enduring drug neurotoxicity (protracted withdrawal) that doesn't yet allow for employment. While healing, the author enjoys cooking, advocacy work and serving in a withdrawal group offering support to others in their efforts to be free from psychiatric drugs. Thanks for this article. You have obviously thought carefully for a long time about these issues and amassed a lot of knowledge about benzos and the mental health care systems that manage their use. At the time that I took Klonopin several years ago, during a period of overwhelming anxiety and terror, I was fortunately aware of its dangerously addictive potential. For that reason I forced myself to stop taking it after only a few months of relatively low doses. It was hell (the fear, not tapering off; I never got strongly attached to Klonopin) and it could have been easier in the short term if I’d taken higher doses and stayed on the drug. But I’m so glad I did not do that. I really benefitted from accurate information about the addictive potential of these drugs early on, something many people don’t get until it is too late and they are already strongly bound to the drug biologically and psychologically. If you respond to this, can you comment in a general sense on why you do not yet feel ready to publicly speak out on these issues? I am in a similar position to you. I am wondering what holds you back… what bad consequences do you imagine work-wise, socially, etc.? Thank you for your comment. I am glad that you were already aware (or made aware) of some of the possible outcomes from the longer-term use of benzos. Remember though, they don’t only have “addictive potential”, they also have dependence potential. I just point that out b/c appropriate language is the whole topic of the article. If you took “small doses” (there really is no “small dose” when it comes to benzos- I’ve met people in the withdrawal communities who became dependent in as little as a few weeks on the smallest available dose and who suffered just the same in severity and duration as people who were on them for 10 years at higher doses) for a short period of time, as directed by your doctor, you weren’t displaying any addictive behaviors and only then at risk for their dependence potential. Part II of the article (to come soon) gets more into this addictive potential vs. dependence potential business and why it’s important to use the right language in order to warn and provide informed consent (stay tuned!). To answer your question about anonymity, there are a number of reasons. Mainly, due to this iatrogenic benzo nightmare, and subsequent misdiagnosis of both addiction and so-called “mental illness”, I have lost a lot- my ability to work, friends, house, income, etc. I am remaining anonymous (for the time being) to be sure I can resume my career and present my case as to what happened to me from a place of full healing and having nothing that interferes w/ that process going smoothly, as it’s my only chance of getting back on my feet financially. Secondly, I am still suffering from the protracted neurotoxic effects the benzos had on my brain and nervous system and due to the nature of some of the symptoms that come with that (paranoia, mental confusion, cognitive issues, memory issues, etc) , I felt it was better for me to recover completely and make the decision to come forward without anonymity from a place of feeling safe and with full mental clarity and complete healing. I am not ashamed of this at all, and I don’t think anyone who is a victim of iatrogenic injury should be, and feel quite passionately about speaking out about this cause with many plans to in the future- the timing just isn’t right yet, as healing isn’t happening as quickly as I’ve been willing it to. I hope that answered your question. Sure… thanks for your response. I totally understand. I am in a similar position of having returned to society after a MH diagnosis but not wanting people I work with to know for fear of losing employment if some uninformed person thinks it means I can’t do the work… that’s why I had asked. As someone who has worked with people with addictions for over 24 years and has written about and discussed benzodiazepines many times on the MIA blog, I found this article to be very informative and challenging. I certainly have been guilty at times of confusing or misusing the terms ” addiction” with “iatrogenic dependence” when discussing benzos and other prescribed drugs. This blog helps me clearly understand the scientific AND political importance of using these terms correctly; I will try to do better in the future. One area where these concepts can become blurred and increasingly confusing is when people prescribed benzodiazepines for the long term are also using other sedative hypnotics such as alcohol and/or other drugs classified as opiates. Now we have exponentially greater risk for a “perfect storm” of dependence or (in some cases) addiction that can often lead to death because of cardiac and lung suppression. JD thanks again for this blog, the benzodiazepine crisis and the complicit role of Psychiatry and Big Pharma in this oppressive tragedy needs more exposure, education, and activism. Your blogs will play an important role in this process. Hi Richard, Thank you for your comment. Thank you too for putting thought into care with language. As someone who has worked with people with addictions, it’s important that the addiction/rehab/detox community can discern between addiction and dependence so as not to misdiagnose, harm and further traumatize people who are merely iatrogenically physically dependent. I did read your last blog and while yes, *some* people are put on opiates and start to develop addictive behaviors and abuse the drugs and take other drugs (sometimes benzos, alcohol, etc) in combination with them looking for a “high” or go on to become heroin addicts, many people are compliant on opiate therapy as well (and probably suffer suspicion and mistreatment b/c of the abuse epidemic that has occurred w opiates, some in part to negligent prescribing). Remember, though, that Dr. Heather Ashton’s work was a clinic with 300+ people who came TO HER asking for her help to get off of these drugs that their doctors prescribed to them. This is the case for most everyone I’ve met in the online withdrawal community over the many years I’ve been active in it. The vast majority of those people are victims of iatrogenesis who took the drugs as directed for many years, sometimes becoming very ill from tolerance b/c they DID NOT increase their dose, but rather continued taking the prescribed amount, thinking it was “medicine” they “needed” b/c their medical provider told them to continue taking it. Most of the people desperately want off and are quite upset about the deception they feel that this was done to them without any informed consent. There are conservative housewives, elderly folks, educated professionals caught in this trap who have no history of abuse or addiction, who weren’t swallowing their Ambien, Xanax or Klonopin and washing it down with alcohol, getting them of the street, and taking them with opiates (other psych meds? yes. b/c often psychiatric misdiagnosis of the tolerance occurs) but instead thinking they are complaint patients “treating” something. I don’t think the majority of iatrogenic benzo dependence winds up like opiate dependence that results in addiction and sometimes heroin addiction (which is probably why most of the opiates that put people on that path are schedule II drugs and benzos are schedule III drugs). Instead, people just take the benzos compliantly sometimes for years and years and are oblivious as to what’s to come in regards to drug neurotoxicity and severe withdrawal. *CORRECTION: Sorry, I meant… “why most of the opiates that put people on that path are schedule II and III drugs and benzos are schedule IV drugs”. It doesn’t allow me to edit after the fact. I’m curious, is “iatrogenic dependence” really just the same thing as neurophysiological adaptation? Both ultimately are caused by the medication/therapy itself and both involve tolerance & withdrawal. What’s the difference if any? Iatrogenic means: of or relating to illness caused by medical examination or treatment. And dependence refers to physical dependence which was defined in the article as: a state of adaptation that is manifested by a drug class specific withdrawal syndrome that can be produced by abrupt cessation, rapid dose reduction, decreasing blood level of the drug, and/or administration of an antagonist. So, ultimately, in regards to benzos, we’re probably talking about the same thing except that iatrogenic just indicates that it’s a result of medical treatment. (Plysical dependence can happen in and be one component of addiction too since people are still exposing themselves to the drugs, but is not a result of medical treatment and also involves abuse and behaviors not seen in physical dependence alone). ok, thank you. I thought it was the same thing but wanted to make sure. Maybe a part of the solution might be changing or adding a dx for neurophysiological adaptation in the DSM if for some reason iatrogenic dependence dx is for some reason not the terminology “they” want? IDK, but seems foolish not to have that distinction. Great article. I’m a chronic pain pt & would like to show my doc, I’m just afraid to do it. Mentioning this type of thing in that setting is almost asking for trouble, unfortunately. I didn’t know what addiction was when I started benzodiazepines. I thought addiction was falling in love with the effects so bad that you just want to keep taking it no matter what. I started the Xanax 1mg, nice feeling but not the greatest thing ever but it did help with going to bed ‘on time’ like other people did and I never could. Then I am given clonopin , didn’t help with sleep as well and the feeling was not as nice but I kept taking it. I had no idea that addiction or dependence or what ever you want to call it was because of how BAD you feel when you try and stop taking it, I always wrongly believed people became addicted because a drug made them feel so good they fall in love with the effects and wanted more good effects. I ended up in rehab and like the article points out ALL the blame was put on my because “I am an addict” and everyone else takes no blame at all. The package did say addictive or habit forming or something like that but again I thought that meant loving the effects and I knew nothing about the part where you get anxiety and withdrawals from hell if you try and quit. They need to redo that warning label so it describes what actually happens in regular words people can understand. Warning: This drug makes anxiety kind of go away and feels nice but if you take it for a wile and then try and quit you have panic attacks, a scary loss of reality feeling like a trip to hell you cant even imagine and the only way out is to take more of the drug to make that stuff go away. And PS of course they called my withdrawals “mania” and gave me the bipolar label and all that goes with that. Thank you for your comments. Part II (to come soon) of this article addresses the first part of your comment about not knowing what addiction was and why the language is so important in reaching people who are probably dependent and unaware b/c they’re not addicted or abusing the drug (stay tuned…). I thought the same thing, FYI, and because I wasn’t addicted or abusing it, I falsely believed that the benzos were safe and why would my doctor prescribe something harmful to me, so the only people who must get harmed are the ones who don’t take it as they’re supposed to (wrong!). Addiction basically is the behavior of wanting to keep taking it no matter what. It’s the behavior of abuse of the drug (the more descriptive definitions are above in the article as to the differences). If you were prescribed it for insomnia and took it as directed by your doctor, you were made iatrogenically dependent without informed consent as to the potential for dependence and withdrawal syndrome. I, too, wound up in detox as my bio states b/c I figured out on my own what was happening after years of illness due to tolerance and toxicity and I wanted off this stuff, but had no idea of the tragic outcomes of cold-turkey or that I was supposed to taper. I was gravely harmed as a result (and am still suffering three years later as a result of that negligence). I agree there needs to be more clear warnings and informed consent from the medical professionals prescribing these and, most importantly, adherence to the 2-4 week prescribing guidelines. I also was falsely diagnosed as having so-called “mental illness” from the tolerance, toxicity and withdrawal the benzos caused. I am so sorry for what happened to you. When I tried cocaine with my tough guy friends as a teen I was curious what it did but I was very scared. That’s cocaine, that addictive stuff they warned us about that can trash your whole life. I did the cocaine, besides the usual bad trip of up all night and depressing paranoid hell when its gone. Nothing really bad happened. It came around our parties sometimes back then. I did it a few times. Now years later I read on this Xanax package this little pill nice old ladies take for anxiety “may be addictive” ya what ever, I did real drugs and nothing bad happened no way this old lady pill is going to hurt me. No way. It hurt me more than I could possibly describe. There is no scientific evidence that addiction is a disease. This fallacy is part of Biological Psychiatry’s disease/drug based medical model of so-called “treatment.” It also serves the narrow interests of the 12 Step dominated addiction treatment industry as well, and stands as an impediment to people seeking permanent solutions for long standing addiction problems. Name another disease that you can wake up one morning and decide to stop a certain behavior and you no longer have any of the negative “symptoms” associated with that behavior. You cannot wake up and decide to no longer have diabetes or cancer, but you can decide to stop drinking or using certain drugs. Now this decision process may be difficult and complex, but never the less, it is still fundamentally a cognitive choice or decision. Just wanted to add that I really do appreciate the input as I am trying to learn as much as I can on these topics. thank you! You seem invested in still viewing addiction as some sort of brain disease when there is no definitive evidence to support this contention. He has been part of those scientists and doctors hell bent on finding evidence to prove various “genetic theories of original sin.” All of this serves the agenda of those that want to blame “bad” genes and society’s victims rather that be critical of the systemic institutional oppression inherent within our economic and political system. Are there some genetic factors in addiction, maybe. We do know that people who have a higher tolerance for alcohol seem to be more prone to becoming addicted. Perhaps because they feel the positive effects for a longer period before some of sedative and more toxic effects take hold. Also, there is some evidence that Asian people do not process alcohol as efficiently therefore they may suffer some negative physical effects (more than most people) that deters them from drinking excessively. Also, I once saw a presentation which theorized that people from Celtic countries that endured the potato famine may have consumed whiskey and other self made forms of alcoholic beverages as a way to obtain sugar based calories to avoid starvation. The contention was that over several generations this may have genetically resulted in future generations having a higher tolerance to alcohol, thus be more prone to addiction. This is still in the realm of speculation. And even if we found out that some people were more predisposed to addiction it may have very little meaning in today’s world given just much is wrong with the majorly flawed environments that surround us. I believe ALL human beings are genetically prone to develop addictions and the symptoms that get labeled as “mental illness.” No body stands above this happening to them in the right circumstances in a particular person’s life. And most importantly, all human being are genetically predisposed for *recovery* from these adaptive behaviors or coping mechanisms. Both forms of these coping mechanisms (addiction and “symptoms” such as depression and anxiety etc.) serve an important evolutionary function for our species. They only become a problem when they get stuck in the “on” position. This raises serious questions about the efficacy of the long term use of opioid pain drugs and the subsequent related proliferation of pain clinics in this country that began in the middle 1990’s. This is all intimately connected to opioid epidemic that is raging throughout the country and raises serious questions about the complicit role of the pharmaceutical industry and certain sections of the medical establishment. Benzos are so damned effective in the short term and the doctors know this. This appeals to the worst of their “Dr. Feelgood” persona. Of course, the patient/victim in these circumstances is usually in a state of desperation due to current problems/stressors and related conflicts with their environment. It is the overriding responsibility of the doctor in these situations to redirect the patient to other avenues and resources to solve their problems with anxiety or insomnia. “Do no harm” is suppose to be their guiding mantra in giving medical care to people. Just as with antibiotics, doctors need to set safe boundaries and know when and how to say “No.” They are failing massively in this area of medicine and Big Pharma deserves more than half the blame. The negligence and harm done with benzos in today’s world, when looked at from the broadest perspective (numbers harmed and damage done), may represent one of Psychiatry’s greatest crimes against humanity. We must expose these crimes and provide much needed help to all the victims/survivors. I still believe it should be the number one focus of our organizing efforts against psychiatric abuse at this time. I agree, i don’t think it’s enough to give someone a piece of paper (if it’s given at all) that says “benzos can cause dependence” and have them sign on the line and then prescribe them for years and years. And just telling people they cause dependence without a explanation as to what that really, truly MEANS is not really informed consent. People need to know in detail what dependence and withdrawal from benzos actually looks like (sometimes years of painful tapering and sometimes years of recovering from the neurotoxicity they cause) and how they can fully devastate your life BEFORE deciding if the benefits outweigh the risks for whatever they’re choosing to take them for. None of this happens. I’m not even sure the doctors know or believe it’s possible, to be honest. Or maybe they just don’t want to for financial gain as you mentioned, I don’t know. Stricter restrictions on them or just keeping them in hospitals and medical settings only and adhering to the short-term use guidelines would be the solution to all of this (and of course, in the meantime, allowing the people who are already dependent the time they need to safely taper off in the interim). It is definitely a crime against humanity and much more harm than good is being done w/ benzos. Too frequently we hear of suicides in the online withdrawal communities b/c of these drugs and their painful, persistent withdrawal syndromes because people feel hopeless that it will ever end and there’s seemingly nowhere to turn for help or support medically. Then there’s the fact that they actually CAUSE the very thing they’re often prescribed to treat (anxiety, panic- as well as more problems that weren’t there to begin with) after being prescribed too long. Who would take, say, a cancer drug if it’s just going to give you worse cancer in the end? And yes, the language is important. There are way too many of us, you are right. And everyday, it seems, new people show up. I am shocked (but not really b/c $$$) that the horror continues after fifty years without something being done to curtail the prevalence and devastation. But it feels like we’re still in the dark ages with the medical profession even refusing to believe in some cases that this is even possible or that the drugs caused it. Congratulations on completing your taper and 23 months of benzo freedom (although I appreciate it’s hard to call it “freedom” when you feel anything but free as the withdrawal persists for so long). Keep going- I will too. I believe healing will happen in time, as it has for so many before us. This is amazing, J. Doe. Thank you so much! I think this article should be mandatory reading for anyone with a prescription pad, and I can personally vouch for all the points made herein. I’ve been lied to about drug safety over and over by many doctors, have been prescribed benzos for over a decade, have been treated like I was “drug-seeking” when only taking them as directed, have been given dangerous advice about tapering/discontinuation by multiple doctors, have been treated by multiple doctors as if withdrawal symptoms were evidence of returning or emerging psychiatric “disorders,” and have had my experience of protracted withdrawal (I agree that drug neurotoxicity is a more fitting term) flat-out denied over and over by multiple doctors at the time when I needed their help most. I respect your thoughts on addiction not being a disease and feel similarly, personally. But I didn’t want to get into that in the article, as it really is another topic in itself. The medical model, however, does describe it as such and so I kept w/ the medical definitions in order to stay on track. I’ve seen other pieces posted here on MIA though that argue the same point about addiction and whether or not it’s a true disease, so it seems there’s certainly debate going on about that topic. What was important to me w/ this piece is making point that they (dependence/addiction) are, in fact, not the one in the same and the harms that occur to the patients when this confusion occurs. Thank you for sharing your experience in regards to iatrogenic benzo dependence and how you were treated by the medical community. It sounds all too familiar and, as you probably know, most of the stories in the withdrawal communities are much the same. I am deeply sorry that you experienced what you did. Thank you. I’m so sorry that you’ve also had these terrible experiences. What elegant research! Congratulations on taking control of your healing. I did my taper from benzos (and others) before I ever heard of ‘iatrogenic illness,’ which, when I did become privy to it, I realized that this is what had occurred, that the medical treatment had actually made me ill. It was rough, especially since at that time, I knew of no one else in the world who had released all medication after a long period of using them (for me, it was 20 years before I got rid of them). But I did recover fully in time and found my grounding and health once again, as I know people can, with the kind of focus and diligence you are exemplifying. Very best wishes on your remarkable jouney. No doubt you will continue to help a lot of people by sharing so openly. Thank you for your kind and supportive comment. Wow! How inspiring a story and good to hear that you finally did recover fully and escape the psychiatric drugging. Just curious: Without even knowing you had iatrogenic illness- how did you figure out to taper on your own? Just tried reducing too quickly to face withdrawal, only to get back on and try again until you figured it out…or? This was right after graudating from graduate school and I suddenly found myself disabled, so I knew I was in for quite a ride. I was scared out of my mind, and I guess I mean that literally. So I looked around for answers, and eventually sought help from a medical intuit, who reads subtle energy of the body, and she gave me perfect guidance–for me, personally, and my process–about how to get off the meds. I found an expert 5th generation herbalist, started doing Qi Gong, which was vital because my energy was so depleted, and I began an intense meditiation program where I learned to ground to the Earth, and about how chakras work. That’s what saved me, learning about chakras and energy. This ascends our biology and is much simpler to work with, where energy is malleable and we can direct it with focus. I was a wreck when I started this program, could hardly speak and certainly not very coherently, and I was filled to the brim with anxiety and paranoid thinking. But I felt very safe in this environment and these were teachers who knew a lot of things about which I had no idea. They were really present and progress focused, and they were fully supprtive of my releasing all medications. They weren’t doctors, so they could not advise me about this, but the work I did there replaced the need for medication, because not only was I able to find my natural balance on my own, looking at my own energy and working with that in my life, but it taught me how to self-heal. Changed my perspective so much, that everything around me changed. I was a whole new person, integrated. I’d also been taking a singing and performing class to help me build strength and confidence, and right after graduating from this meditation and energy program, where I cleared a lot of my energy and brought myself into present time, I was offered a part in a play by a director who was taking the class with me. I was shocked and nervous about that, but it was the first paying job that came my way since I had become disabled. I did it, and from that came a career in theater which lasted 7 years until I moved away from San Francisco. I’m established in a small rural town now, very peaceful and grounded–the road I was always meant to be on. I tell you this to show just how much a shift can occur when we come off the drugs and let our nature run freely. A new path appears, and it’s quite remarkable. For me, it was literally a miraculous transformation. I have terrible stage fright and had never sung on stage in my life, but I faced it and it freed me, completely. So no, I did not go back and forth because my mind was made up to stay off of them for good, regardless of anything; but I did suffer through what I just kept tagging as withdrawal and also detoxification. I’d say it took about 4-5 years total to compeltely detoxify, this stuff really gets into us and affects our cells. But herbs are regenerative, whereas chemical medication are DEgenerative, so the herbs and qi gong helped me to rebuild what had become damaged inside me from the meds, while the chakra, grounding and energy work helped me to define myself in a new way, and how to maintain balance, center, and awareness in the midst of distress or chaos, so it was very empowering. Coming off these powerful drugs really shift our core, so one thing I always recommend is to embrace the unknown, and trust your process to take you to where you are the person you were always meant to be. The meds keep us from owning our true spirit, because we have trouble perceiving it on medication, it suppresses so much of our natural truth and rhythm. It’s a very challenging road, but keep persevering, holding steadfast to your goals, and there is a great deal to look forward to ,where it gets easier and easier. I’m of the belief that everythign heals, once we apply ourselves with focus and trust. You can check out my website, and if you want to talk more about this, please feel free to conact me. I’m always happy to answer any questions about meds, healing, transition, etc. This is by far the best article I have ever read about benzo’s. It’s very obvious that you have been through w/d yourself. I’m in my 13th year of fighting these drugs. I’ve been hauled off by ambulance twice due to w/d and have been driven to the ER so many times that I have lost count. Every time the hospital treated me as an “addict” and booted me out of the ER. I hope this article spreads far and wide. This country has a problem that needs to be addressed and not addressed by big pharma. Somehow, some way, the people who have lived this need to be heard. With this article you have taken the first step to make that happen. Job well done!!!!!! Dear J Doe, Thank you for this excellent article. It is a major contribution. My psychiatrization also began with Xanax. It was “safe and effective”…..so I was “mentally ill”. How many millions? A topic near and dear to my heart. Thanks for this…really excellent. I am a fellow sufferer. I tapered Klonopin, and also an SSRI. Despite the tapering they have managed to still obliterate five years of my life, although I have managed to hang on to my job, marriage, and family. I was never told what the drugs might do to me. I feel misled extremely and harmed by Western medicine and psychiatry. I agree that the terminology matters a great deal and am shocked that the medical negligence of detox centers, who’s business it is to know this subject, continues unabated. No one in medicine seems to know or care enough to put a stop to the atrocities going on there. I also agree the term “addiction” is not at all appropriate – it implies drug-seeking behavior. And I think “dependency” or even “physical dependency,” although much closer to the target, do not fully capture it, as I think you alluded to. 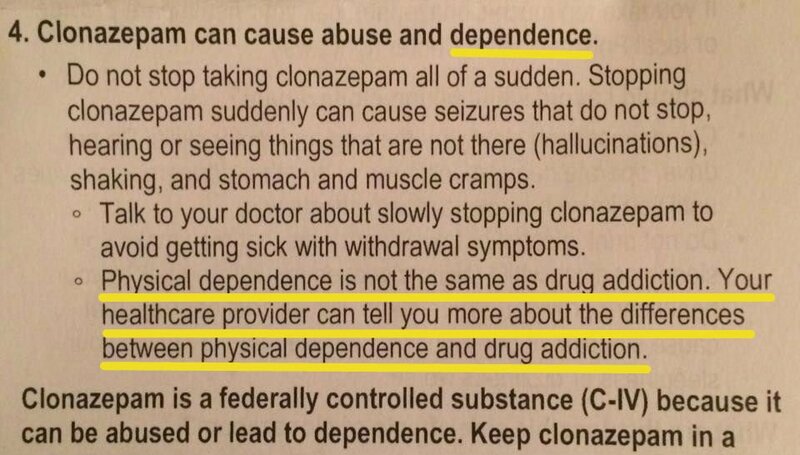 To me “dependency” still connotes withdrawal and is too close to “addiction.” This is not what’s going on with psych drugs. What happens with psych drugs is a physical rearrangement of the receptor systems (new receptors are created or old ones abolished, neurotransmitter levels are increased or decreased, the way receptors systems interact and influence is altered) as the CNS tries as best it can to adapt and function homeostatically in the presence of the drug. To me this is much closer to – and maybe actually is best called – neurological damage (hopefully reversible) as it cannot be reversed over a short time span like other drug withdrawal effects, and remains long after the drug is gone – often years after. The tapering process is truly a physical damage healing process where the CNS has time to slowly reverse the damage done by the drug. I’d like to move away from the terms “addiction,” “dependency,” and “withdrawal” completely and really get to the root of what is happening by describing and depicting it for what it really is. The terms “addiction,” “dependency,” and “withdrawal” are borrowed simply because we don’t know what else to call it. Thanks for bringing this subject to light and doing a fantastic job with the extensive research. Great comment, spatler. I totally see your point. For now, with what language we have to choose from, I guess I am ok with “physical/physiological dependence” as it describes the physiological changes that occur in the body when one is taking the drugs. It really is, though, as you describe, a down-regulation of the GABA receptors which seem to get “stuck” in that downregulated position after too long exposure to the benzo agent. What I believe (and touch on in part II) is that there most definitely needs to be a name and diagnosis for the SYNDROME that occurs when the people who experience this downregulation from use of the benzos STOP taking them (either in taper or too rapidly). And that maybe the name could give greater understanding and a platform for this condition that is so desperately needed. It is definitely damage (albeit reversible over time, temporary) and neurotoxicity and the changes that have occurred from taking the drugs for prolonged periods and is much different and much more debilitating, dangerous, and severe than most all other drugs (excluding other psych meds from what I’ve seen/heard from the, say, antidepressant communities). When I was in detox, the street drug users were playing basketball after a few days of being detoxed. My cold-turkey state was just getting started and the syndrome only beginning and continued to worsen as I remained in that state. “Withdrawal”, to me, is suitable, as well, to describe the time period when one is actually removing the drug in a taper, but doesn’t describe much else. If you are tapering, you are withdrawing the drug or perhaps “reducing”, too, would be suitable (as in reducing the dosage). But so many people, for lack of better descriptive terms surrounding this issue, continue to call the post-withdrawal syndrome or time period…withdrawal. “I am in withdrawal”. When really, as you state (and as Dr. Shipko was quoted in the article as stating), they/we are in a persistent state of neurotoxicity (or of having neuropsychiatric damage/toxicity) and damage that is not always reversible over a short time span. I am lucky enough (after desperately going through multiple uninformed practitioners) to have found a doctor that was open-minded and willing to learn, and she says to me all the time now (after getting educated): “This is a form of brain damage. You have brain damage”. As scary as that may sound to some, for me, it provided much validation and comfort that she understood it in that way. Thank you for your very insightful comments which made me ponder the topic even further. It is so important we bring awareness to this issue and come up with ideas and solutions together as victims of this, as there’s too much confusion and not enough understanding – and the people who are suffering as a result of it are the victims. As a person who has lived experience of long-term addiction to and abstinence from psychiatric drugs, I can say with confidence that you are truly a survivor of psychiatry. In 1999, psychiatry sold me on their drugs and for three years straight, they turned my body into a chemical waste heap. Starting in 2002, I began a five year process of quitting all psychiatric medications. Before I got to the one-year-clean (yes, my body was, literally, filthy with these poisonous drugs) milestone, I had nine relapses which either preceded or followed inpatient psychiatric hospitalizations. All of my attempts at breaking my addiction to these drugs were started, failed, and completed without any medical assistance. I knew that no clinician would help me stop these drugs and that I could be petitioned for court-ordered treatment if anyone knew about my “medication noncompliance”. This was the hardest time of my life and it was all the fault of psychiatry, yet no psychiatric clinician ever tried to help fix or compensate me for the problems their “profession” was putting me through. To endure this and then relive it in detail on the Internet is beyond brave. I am in awe of your indomitable self-worth and your genuine concern for the health and safety of Mad people. Congratulations on freeing yourself from psychiatric drugs, without any help from the psychiatric profession (a reality that is more common that not). You don’t say whether any of the drugs you were taking was a benzodiazepine. I can’t help but notice that you use “addiction language” to talk about your experience with psych meds and the process of getting off them. This is confusing to me, as the whole point of the article you are commenting on is that using words like “addiction” in relation to doctor-prescribed benzos is problematic and perpetuates harmful perceptions and practices. As JD makes clear, calling an iatrogenic dependency on benzos an “addiction” has the very real potential of leading not only to misjudgments (i.e., making assumptions that benzo dependency is in the same category as true addiction) and mistreatment (such as detox or too-rapid tapering) that can have dire and even fatal consequences. I salute you in being able to get off psych meds on your own. But for many people who have been made dependent on benzos and need to rely on continuing scripts in order to endure the long and painful process of withdrawing from the drugs, the stubborn misunderstanding of and outright dismissal by the medical community (and much of society) has made the syndrome of withdrawal and neurotoxicity far worse than it is already. Changing language is a step toward changing protocols and potentially toward changing minds. As JD’s article argues for in such depth, I’m hoping we can start using appropriate terminology here–especially those of us who have already been so harmed by these insidious drugs. Dear J Doe, you write “words can put vulnerable people at risk—not only to their sense of self-worth, their sense of self-knowledge.” A word formulation I agree with, although from the perspective that the words we use for social communication, is not the reality of our motivation. In fact, since acquiring the kind of knowledge which explains a hidden motivation beneath my skin, I’ve embraced R.D. Laing’s intuitive understanding of the paradox of modernity, in his comment: we are all in a posthypnotic trance induced in early infancy. Embraced the false-self illusion, that I knew myself, simply because I could speak, read and write, words. Dissolved my normally adjusted ego sense-of-self, by making the words of recent neuroscience discovery, flesh. Which has allowed me to remain medication free, for eight years now. A making words flesh, journey of experiential self-exploration, which has brought me a visceral sense of Jaak Panksepp’s comment: we are all brothers and sisters under the skin. By of how our nervous systems mediate the internal relationships of our body’s major organs, and create our mind’s, subjective experience. An under the skin sense of reality, that can bring an embodied sense of limits of language and self-interested survival, to: A WAR OF WORDS: THE DSM AND DEPENDENCE, and the egoic war of words involved in posts and comments here on MIA. A language based delusion about human motivation, which sees the curious paradox of normal self-interested function, which ignores well formulated essays like this one. While Laing explained the self-interested illusions of his own profession by drawing attention to human behaviour and how we avoid examining our own, with a language of self-deception: I see you, and you see me. I experience you, and you experience me. I see your behaviour. You see my behaviour. But I do not and never have and never will see your experience of me. Just as you cannot “see” my experience of you. And Allen Frances sums up psychiatry’s behavioural dilemma with: psychiatric diagnoses is seeing something which exists, but with an expectation of what we see. A post hypnotic trance addiction to words, which Alexander Johnson sums up with: the delusion is extraordinary by which we exalt language above nature. The hidden nature,of our nervous system motivation, in my experience. You mention the words informed consent and I wonder how you feel about the informed consent around the dangers of smoking, and the paradox of normal behaviour, which ignores both written words and graphic visual images of smoking related disease? I wish you joy, in your journey towards non medicated self-regulation. Antidepressants lead to addiction. Why they keep ignoring this is beyond rational common sense. I have all four symptoms of addiction from SSRIs………. Most poeple trying to get off them, yes lie to doctors (if they didnt the doctors will CT them, and that is a big fear, or else demand they take more drugs, and yes, doctors have the power……)……….. Yes you end up without a life, just like all the “”illegal drug addicts” end up on disability or suicide. they destroy your real personality, just like all the illegal drugs do. But hey, they are cheap, these drug dealers all backed by governments, and on the PBS schemes, gosh the drugs are cheap. Great con from Legal drug pushers………. Yes so angry, lied to, life destroyed………….. Lying to your doctor (or twisting the truth) to get the SSRI in order to taper or not be cold-turkeyed b/c they are ignorant to the dependence/withdrawal potential of these drugs or for your own health and survival is not the type of lying I think they’re talking about. I think they’re talking about things like doctor-shopping to get a large quantity of drugs to abuse and take more and more of that drug to get high. Typically, we don’t see people taking huge amounts and dosages of an SSRI for a “high”. And then doctors or psychiatrists demanding you take more psych drugs as a result of the complications from the SSRI being misdiagnosed as so-called “mental illness” requiring more drugs is not the “taking more and more of the drug” they’re talking about (think someone taking hundreds of milligrams of codeine in a day when they were only prescribed to take, say, 60mg per day for a short period of time, who then is buying them off the street and going to doctor after doctor lying about pain to obtain more and more to abuse in very high dosages). All of that that you describe is just iatrogenic physical dependence that is misunderstood and mistreated/medically mismanaged and so the patient is forced to lie or go from doctor to doctor desperately trying to find someone who believes them and to get the drug/SSRI they need in order to not get cut off and sent into a devastating state of CT so they can taper appropriately (but to still take the same prescribed dose they are dependent on). IMO, that is just smart and survival and getting other medical opinions and being your own health advocate. I agree, however, that the psych meds do destroy personalities and devastate lives in similar ways. Thanks, JD. I think it’s important to continue to make the distinction between “addiction” and physical dependency when it comes to psych drugs, for all the reasons that you spell out in such depth in your piece. It was a Ritalin transdermal called Daytrana that threw me into psychosis and cost me the things that mattered, but along the way I had an instructive bout with Ativan. It had been prescribed by the same man who prescribed the Ritalin, and when I expressed misgivings about becoming dependent on it, that MD said “So what? Just take it for the rest of your life.” It was only a few weeks in that I found myself on the way to dinner to meet a man from OkCupid, who’d said lateness was a pet peeve, and realized my planned stop-off at the pharmacy to replace my empty Ativan bottle with a full one would make me late for dinner. It was only meant as a friendly dinner, not a romantic one, but I still felt it best to arrive on time. Before our food was served I began to feel weak, tired, desperate, and very much in need of lying down. He was prattling on about some horrific woman he couldn’t get over, and I was trying to decide between calling paramedics, lying on the floor near my chair, or possibly making it to the restroom and lying on the floor there. I am thankful that I remembered a third or a quarter of an Ativan tablet that I had put in with the oral Ritalin I had in my purse. I took it and felt absolutely normal within 15 minutes. Another blessing is that I felt fine in the morning and that was the end of it. I did become fully unhinged by the Daytrana which initially was pleasant and fascinating to the point of magical, but which decayed into hostility, paranoia, seizures, inability to read without rapidly losing consciousness, loss of boyfriend/presumed best friend, and loss (as a victim of forgery and fraud) of long-held investments and thus my retirement income. Yes, the packet warns of psychosis, but what on earth good is a warning you read three weeks ago when you are talking to angels, hallucinating demons, and dancing with what you think is the shadow of your skeleton? The same holds for warnings about benzos. They cannot prevent a condition with a silent, insidious onset. Warnings about catastrophe serve only to keep plaintiffs from prevailing in court. The catastrophes roll on. The doctor? Up against the medical board, owing $100,000 in back taxes, and with luck, not going to practice in the future. If only they’d taken his license the first time he was brought before them instead of allowing him a period of probation. The state he started his career in did. They caught wind of his first California probation and sent a letter saying he’d never practice in New York again. I cringed a little hearing about what happened when you missed your Ativan dose only b/c I know what that felt like. For the doctors who think it’s “no big deal” and that patients should take this stuff for the rest of their lives, I think they should all have to have their own prolonged period of drugging/dependence/toxicity and see what kind of “life” (or lack thereof) that amounts to and how it actually feels. I think the same is true for the ones who try to negligently cold-turkey/rapidly taper patients. If they had to experience it themselves, I think they’d quickly change their tune and see just how difficult it is to get help/understanding from the medical profession that in most cases causes this. Hopefully you were able to safely rid yourself of the Daytrana and Ativan. A really excellent article and I look forward to reading Part 2. Can I wish you all the very best on your way to recovery. I am in my 30th year after withdrawing myself in 1986 of 30 mgs of Ativan and 12 Opiate pain killers, both drugs prescribed on a daily basis by my ignorant doctors. Life does get better albeit slowly in my case BUT the best thing I have ever done in life was to beat this combined addiction and to return to my wife and daughters. Plus, it has given me 30 years of campaigning on the issue of iatrogenic drug addiction and to meet many wonderful, brave people. Hi Barry– Hats off to you for succeeding in withdrawing from high doses of benzos (and opiates) on your own. It sounds as though your life has significantly improved, albeit slowly, in the years since. One thing that continues to confuse me about the comments I’m reading, however, is that many people are not acknowledging (never mind honoring) the author’s main point: that using “addiction” language in relation to iatrogenic benzo dependency is harmful. Instead, they seem to ignore the point and perpetuate that very language by using it in their comments. As JD describes in such depth above, referring to iatrogenic benzo use / tolerance / dependency / withdrawal in “addiction” terms only serves to feed misperceptions and mistreatment–and those who have an iatrogenic physical dependency on these drugs continue to suffer the consequences. I was told by a UK government health minister and a politician that long term prescribed benzodiazepine drug addicts where ” misusers and abusers”. A deliberate attack on innocent patients by government officials and their senior advisors, to not only muddy the waters but to deflect criticism of their total lack of responsibility and accountability and to deny them dedicated withdrawal services for iatrogenic drug addiction. It is governments, doctors and the pharmaceutical industry that has abused and misused patients and world citizens of their human rights. Hi Barry- Thank you for the kind message above. I have read many of your writings about your own story and watched your video (the one with you and your wife) and all were very hopeful and encouraging, which is exactly what myself and others who are tapering from the benzos or suffering from the longer-term drug neurotoxicity in a protracted manner need. Your work and dedication to the cause are much appreciated by the entire benzo community – so thank you very much. I understand what you’re saying to Brighid above, but am still confused on the logic behind insisting on using the word addiction (when this is clearly not addiction by definition). If the government in the UK is trying to write all of the benzo patients off as addicts and blame the patient in an attempt to dodge responsiblity (when this is clearly NOT addiction and a result of iatrogenic dependence/neurophysiological adaptation- as someone else pointed out in another comment/drug neurotoxicity), why then should we continue to refer to ourselves as having been made iatrogenically addicted? Doesn’t continuing to use the wrong terminology (addict/addicted) just further excuse what really happened and continue to put the blame on the patient? Not to mention the implications for people who are actually TREATED like addicts and CT’ed or ripped off the drug rapidly? (which was one of the major points I tried making in the article- that language/diagnosis dictates treatment and if we’d start using the right terminology, perhaps the proper treatment-slow taper, or avoiding long-term prescription of this stuff to begin with- for what the patients actually have-dependence/drug neurotoxicity- would hopefully be better understood/adhered to). Not to mention the social implications of being wrongly mistaken for/diagosed as addicts. Addiction means the behavior of abuse by definition. When you say “iatrogenic addiction” (or accidental addiction or prescribed addiction or any combo of those), you imply that you were initially prescribed them by a doctor and then lost control and began abusing them. That’s what addiction means by definition in the medical world. And that is not what occurred in the majority of the stories of people who experienced iatrogenic dependence from benzos as you well know. In fact, most people become tolerant b/c they DON’T increase the dose and just sit in withdrawal on the same dose b/c their doctor told them to keep taking that dose. I don’t think I’m telling you anything you don’t already know with your years of experience, I just think your choice of descriptive terms is inaccurate and may be perpetuating further ignorance and mistreatment surrounding this issue. Even the BNF uses the word “dependence” (as I hyperlinked in my article). No offense meant or implied, hopefully, in this discussion, as I do really respect you and all of your work and dedication to this cause. I get more into my thoughts on WHY the terminology is hugely important in our advocacy work in Part II (coming this week) of the article. I do hope you’ll read and perhaps take those things into consideration as you go forward advocating for us. Most of us do not want to be called addicts or addicted by our advocates and find it to be a very inaccurate descriptor as to what really happened to cause this damage (self-included). Again, much thanks for your comments, your encouragement, your amazing commitment to advocacy for this cause over the years, and for sharing your story with such transparency in hopes of eliciting change around this horrible human right’s violation. You have, no doubt, helped countless numbers of people. Thank you for your kind words and I really appreciate them. She then asked could we possibly be put in touch with someone else in the Practice on a similar dose ( at the time we obviously where in complete ignorance on the dangers of these drugs ) we then received a letter from the Practice referring us to their Lawyers. You could not make this up. All I ever did was to follow the instructions given to me by the doctors and took the drugs in good faith as to their clinical decision making. I do realise that the term ” addict ” does upset many patients taking benzodiazepines who do not see themselves as addicts in the illegal sense of being an addict. Within the House of Commons a All Party Political Group on Prescribed Drug Dependence has its 2nd meeting on the 24th of this month with a view to formulate a policy to present to the British Medical Association on this very issue, accompanied by several charities, in order to lobby the British Government to take appropriate action and to prepare a template to be used for a safe withdrawal procedure, so that everyone can be singing from the same hymn sheet in the UK. If you kindly want to email me I can let you have further details after the 24th. I also look forward to reading Part 2 of your blog.